We’ve driven the new 992 in several forms, but Porsche is still putting the finishing touches to some of the tastier models such as the 911 Turbo and GT3. While we wait, our spy photographer has managed to capture a 911 Turbo Cabriolet winter testing. As well as the rag-top – which obviously marks this out as a Cabriolet – the test vehicle shown features a four-pipe exhaust configuration. Along the side of the car, vents cut into the rear wheelarches mark this out as the forced-induction Turbo. (Or the turbo Turbo, as we sometimes call it in the office - all 911s are now forced induction). 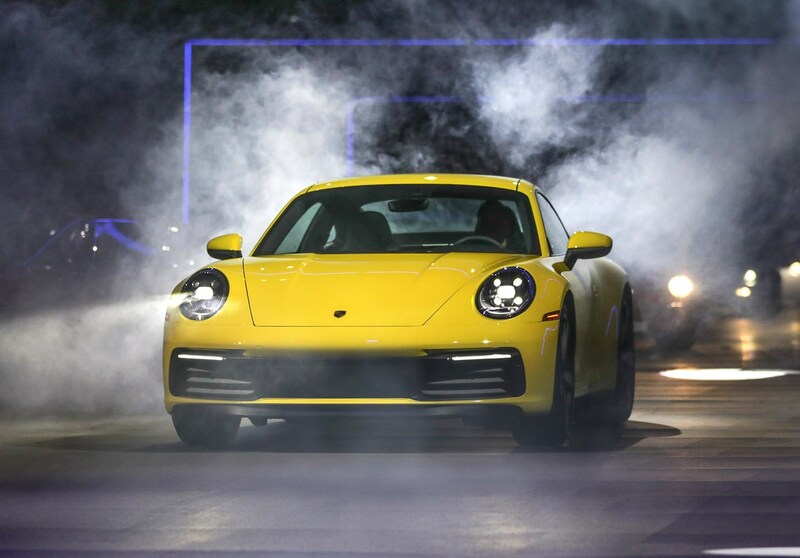 CAR magazine understands the new Porsche 911 Turbo will be revealed sans-camo in September 2019. Keep reading for all we officially know about the new 992-gen Porsche 911 sports car family - including news of the upcoming Turbos and GT3s that'll get enthusiasts salivating. We’ll be updating this story with more info when we get it. Our spy photographers have also snapped the forthcoming GT3 out cold-weather testing, and it's looking stealthy – though that's partly down to the matt black paint. Most of the important bits such as the new front splitter are completely covered – and although we love that rear spoiler, it doesn't look production-spec to us. How do we know it's a GT3? Those centre-lock wheels, vented-bonnet and centrally-mounted dual exhausts give the game away. 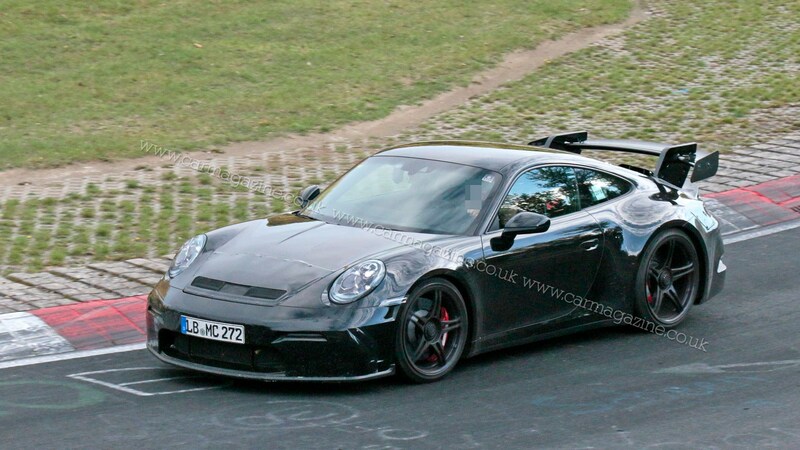 CAR understands that the width of the 992 GT models will not be increased over the standard Carrera S body, and although that sounds disappointing at first, this new GT3 looks to have lost none of the old model's road presence. 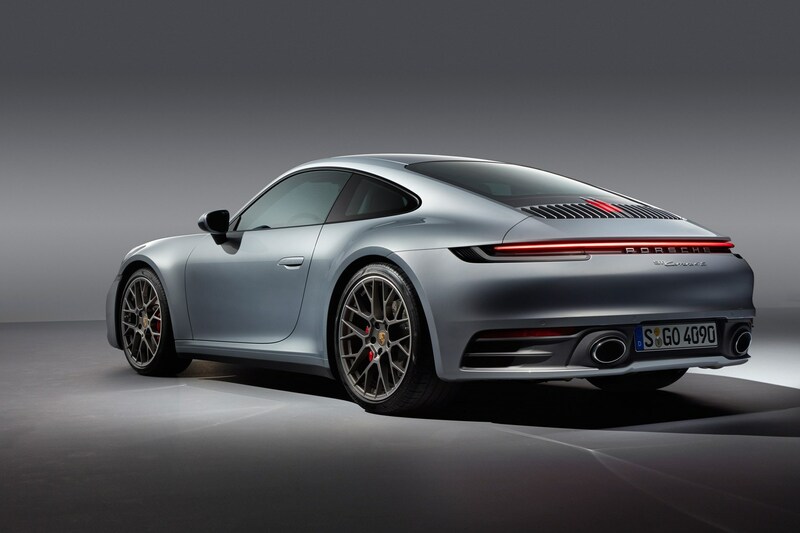 Perhaps that's because the standard 992 is now wider than the stock 991.2. Word is it could appear as early as the 2019 Frankfurt motor show. Are you sure this is the new Porsche 911? 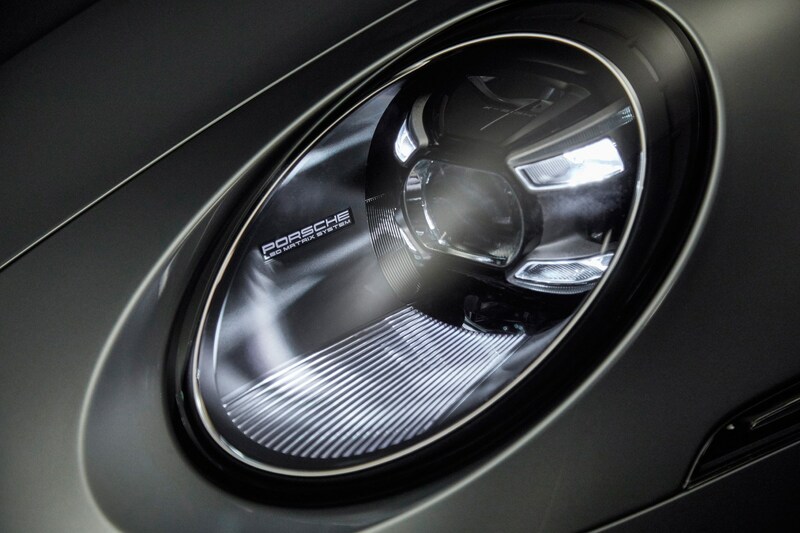 Trust us, we’ve been poring over the 992 for some time now. 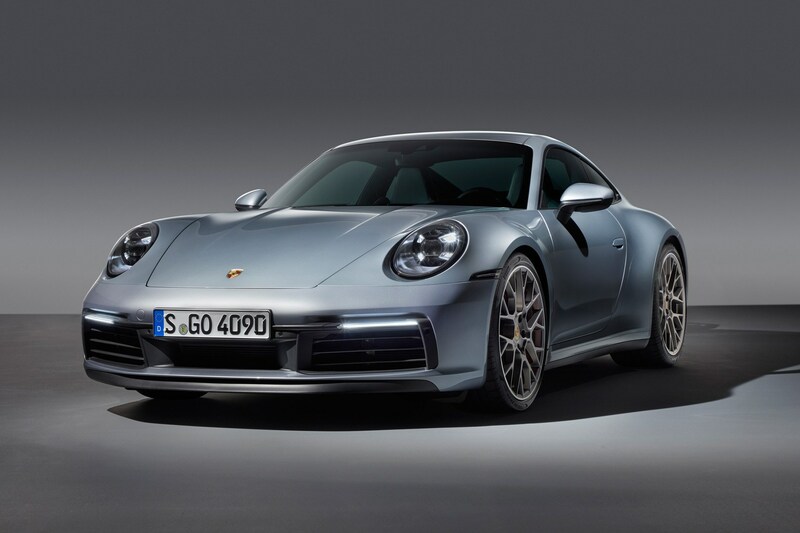 We assure you this is the new 992. 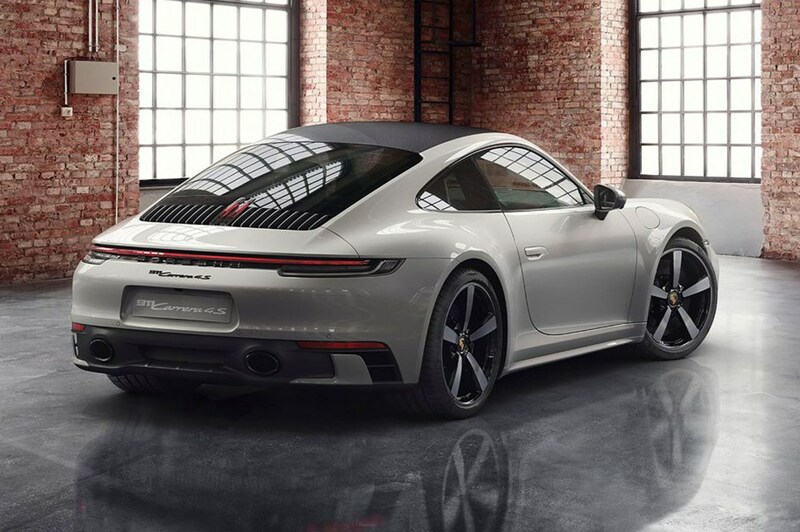 Porsche makes the bold claim that the exterior design is ‘completely new’, but it’s not exactly a surprise to look at – not least because it’s a 911. But it’s also because it’s been spotted so many times without almost any camouflage in the few months running up to the car’s official reveal, so much so that CAR's renders of what it would look like were almost exactly bang-on. 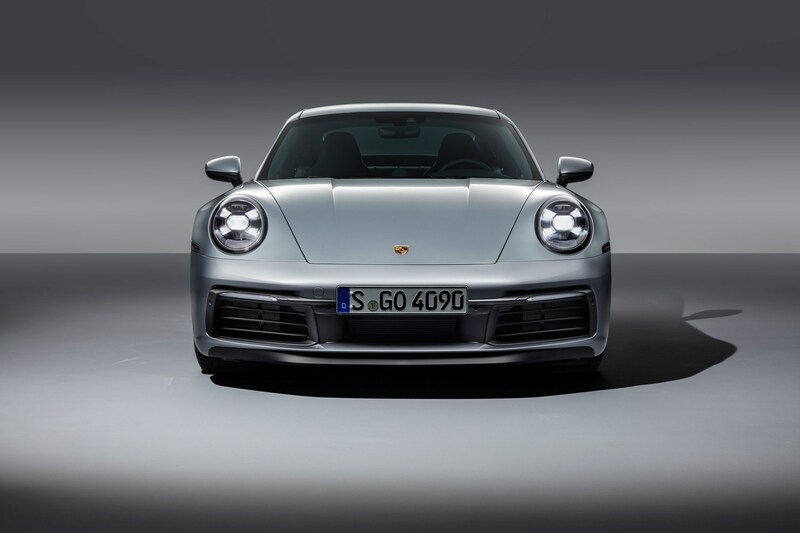 At the front, the new Porsche 911 (992) houses a small central recess in the centre of the front bumper – a nod to some of the first 911s – and some fresh fancy LED headlights. The front is 45mm wider than before, and Porsche says that the rear wheelarches will not be wider for certain future models (like GTS, Turbo etc). Wide hips are now standard on all. Electrically-operated flush door handles feature for better aero, following the Tesla fashion. Probably the most significant design details can be seen at the rear, with a new ‘variable-position’ spoiler in the tail and vertical black vents that integrate the third brake light. A single spanning light bar also features, in line with the rest of Porsche’s recently redesigned range, from Cayman to Cayenne. What do we know about the new Porsche 992 engines? The Carrera S and 4S models use a turbocharged flat-six with 444bhp – 30bhp more than the 991 generation. The S coupe accelerates to 62mph in 3.7 seconds, with the all-wheel drive 4S passing the benchmark in 3.6 seconds. Power is sent to the wheels by a new eight-speed PDK dual-clutch automatic, which will help keep emissions down. There's no official mention of a manual yet, but don't worry - it will still be available. If you pick the Sport Chrono Pack (which has launch control), 0.2 seconds can be shaved off the launch sprints of either launch model. Top speeds are rated at 191mph for the S (190mph for the Cabriolet) and 190mph for the 4S (188mph for the Cabriolet). If you’re bothered, Porsche also claims that the S and 4S models can get up to 31.7mpg and 31.4mpg respectively in coupe form. Inside is a trick blend of up-to-date Porsche tech and some neat heritage touches not yet seen before. 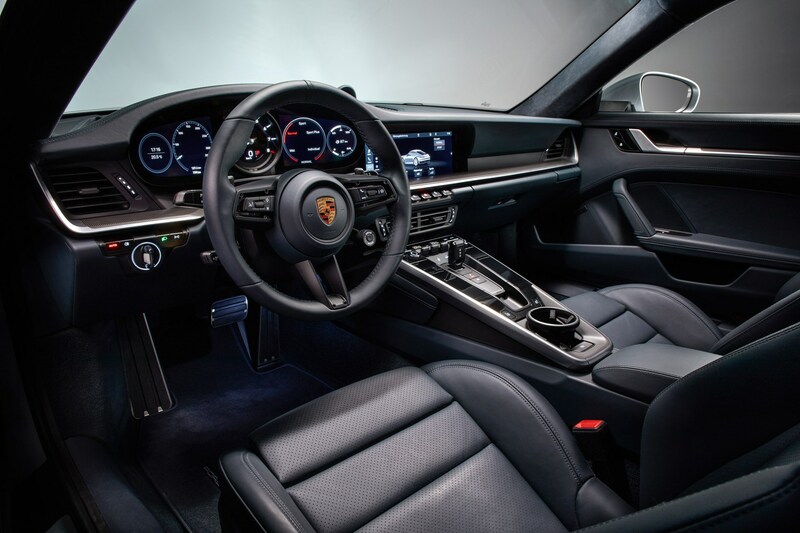 A widescreen infotainment system seen on the likes of the Panamera and Cayenne dominates the centre of the dashboard, and is accompanied by paddle buttons for some key functions located beneath. On the centre console, physical toggle switches control the climate control and infotainment menus and sit just ahead of a simple oblong gear selector. A solitary cupholder now features in the centre, as does the electric parking brake switch – moved away from underneath the lighting switchgear in the previous generation. And yes, you still need a key of sorts to fire the thing up. Porsche purists, don’t fear – the analogue central rev counter is still here with some recessed detailing. It is, however, flanked by two digital screens that show speed, drive mode, navigation information and more. Surely there’s some new tech? You bet. The infotainment system is permanently connected, with swarm data from online navigation letting you know of traffic situations on the road ahead. 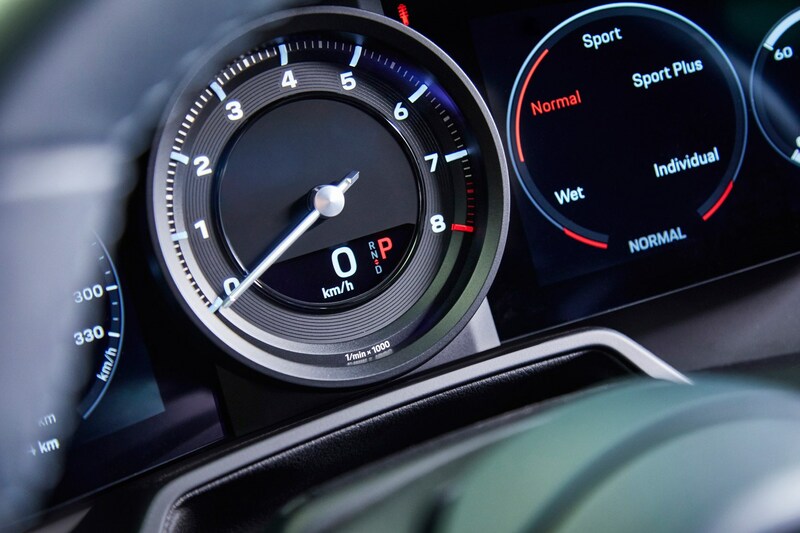 A new Wet mode is standard, which uses the car’s computers to detect water and slippery conditions, prepares the car's drive systems and warns the driver accordingly. Night vision is also available for the first time, as is adaptive cruise with stop-and-go function and an autonomous emergency assist system. Porsche has also confirmed two new apps: Road Trip and Impact. Road Trip is fairly self-explanatory, allowing you to plan long drives and features curated routes that have scenic spots with exclusive hotel recommendations. Impact is designed to track your CO2 output, and provide you with a simple method of paying to offset it through renewable energy projects and forest protection. We've not had a go of the finished car just yet, but we have had an exclusive ride in an all-new 911 prototype – and it's looking good. 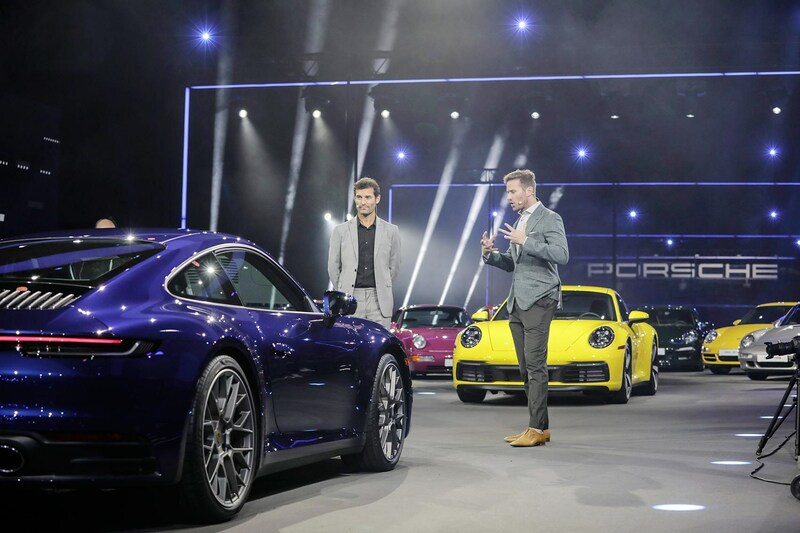 Despite the Porsche's new focus on technology, it appears the tech has only improved the user experience, making the car's extra speed more accessible and easier to handle. 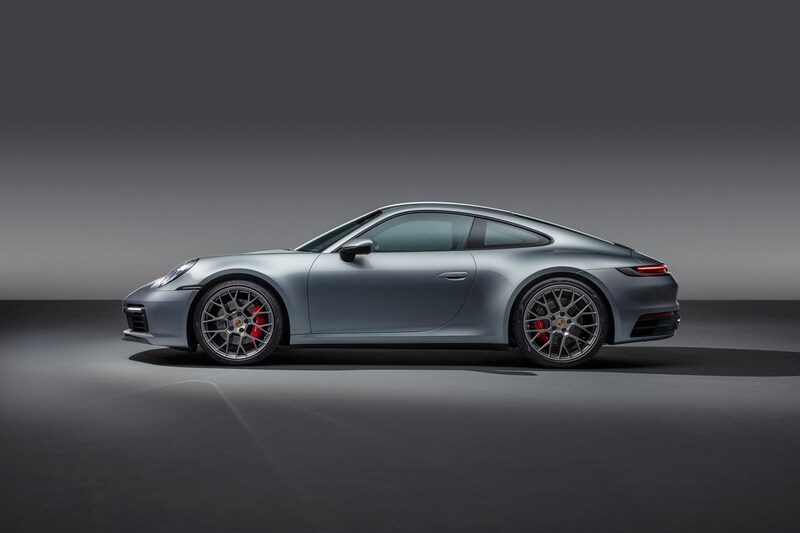 When can I buy a 992-generation 911? 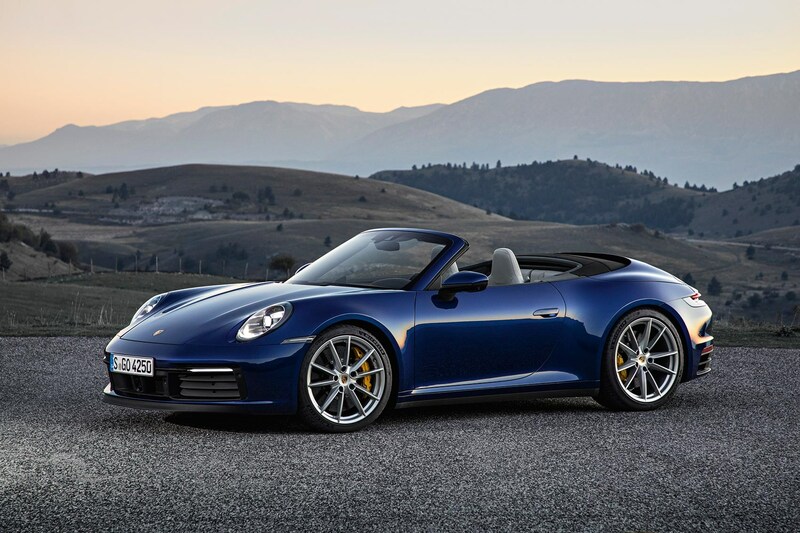 Orders are now open for the Cabriolet and Carrera S. If you’re after a Carrera S coupe, it’ll cost from £93,110 while a tin-top 4S will set you back £98,418. 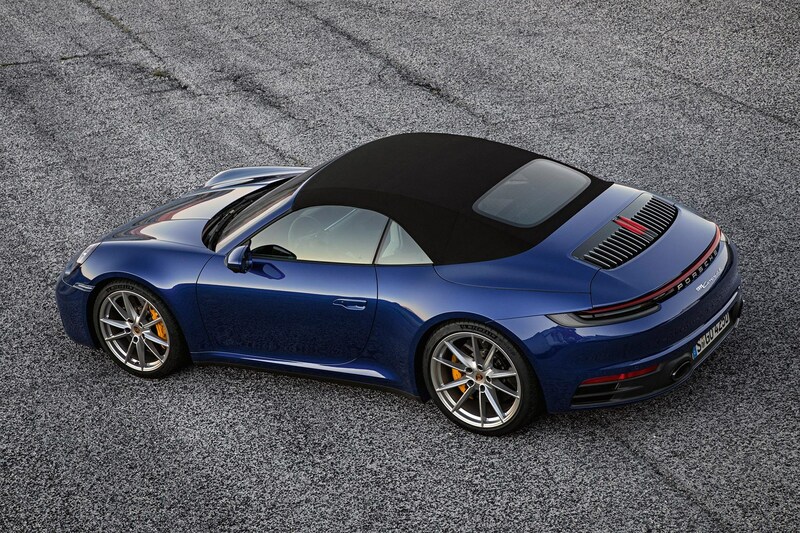 It's a predictable addition: there's been a 911 rag-top in the range ever since 1982, and the new one adds the alfresco element to proceedings with a fully automatic canvas roof that can be lowered at speeds of up to 30mph. The roof is specially reinforced with magnesium bows to prevent the material ballooning misshapenly at speed.